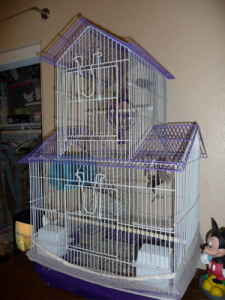 theAd>> 3 Zebra finches + cool cage with extras. Great Christmas gift! Okay folks, it is NEVER cool to give a pet as a gift...ever. 3 pets...even worse. 3 pets that with never, ever be potty trained [or quiet] is simply unforgivable. And as for the "cool cage"...please clean up the "extras"